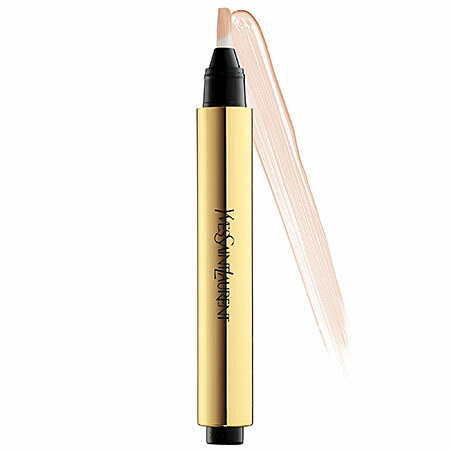 The newest addition to my makeup bag is YSL Touche Éclat in 2.5 “Luminous Vanilla”. Though often marketed as a concealer, I had heard of it’s magic as a highlighter and brightener, and decided to add Touche Éclat to my arsenal as a subtle way to incorporate the contouring and highlighting craze into my daily makeup routine and freshen up my look. I was amazed at how, with a few flicks of her wrist, the Nordstrom Beauty Spot consultant was able to wake-up my 7pm post long day at the office look. I instantly looked like I had either gotten a few additional hours of sleep, or spent a few hours less at the office….a complete win in my book! Plus, I simply love the chic gold and black packaging. It just looks glamorous! Once I got home, I scoured the web for a quick how-to cheat sheet that I could keep on hand to replicate her artful strokes, and found this quick reminder of a few tips and tricks above and beyond virtually eliminating under eye circles. 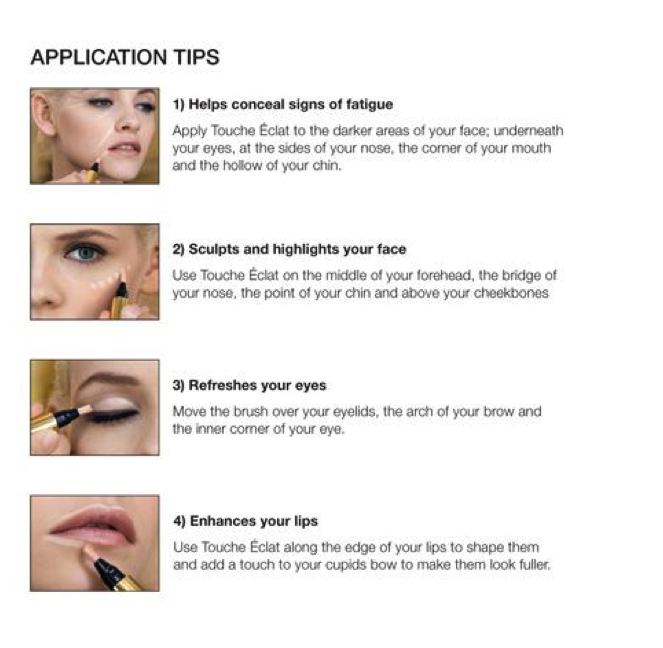 How do you use Touche Éclat? After having been out of fashion for most of my adolescence, I find there is something alluring about gold and brassy metallics these days, especially when mixed with modern textures or when found in totally unexpected objects. It suddenly seems like gold and tortoise chain link combinations are en vogue and gold paperclips, scissors, and staplers are the epitome of cool when it comes to office supplies. One place gold seems to be showing up over and over is my makeup bag from the Gold handled bargain makeup brushes I picked up from Sonia Kashuk’s Target collection to the cult classic Touche Eclat pen from YSL. Even lipstick cases encrusted in gold are cool again with a Tory Burch or YSL lip collection case seeming to be a staple in blog posts and instagrams for instant chic. Despite the recent snowfall, signs of spring are popping up all around us! I’m not just talking anticipation of the cherry blossom blooms along the Potomac and sorbet-hued sundresses at brunch…spring hues, posies, and peonies are popping up on shorts – and I’m loving it! Whether you dare to pattern play, or keep it simple with solid embellishments, these sassy shorts a perfect transition into spring to put some pep in your step and playfulness in your style. Try pairing them with heels and a blazer for a night out on the town, or dive right into the trend with a head to toe short ensemble. Taking the night to enjoy a little light reading with some of my favorites! We recently purchased our first (town)home in the Old Town Alexandria, and could not be more excited! After apartment living, it’s nice to be able to put time into making it our own. Though the first projects were less than glamorous (it was a very Kohler Christmas), now we’re finally getting to the fun part of decorating! I love to entertain so one of the first rooms on the agenda was the dining room. I must admit that I still have a tiny Gossip Girl obsession and found the cushioned ghost chairs in the Waldorf Apartment dining room to be the perfect blend of traditional meets modern. I couldn’t get them out of my mind, and did a bit of research to find that they were the genius work of Christina Tonkin of Christina Tonkin Interiors. I simply had to have a set made, and couldn’t love them more! 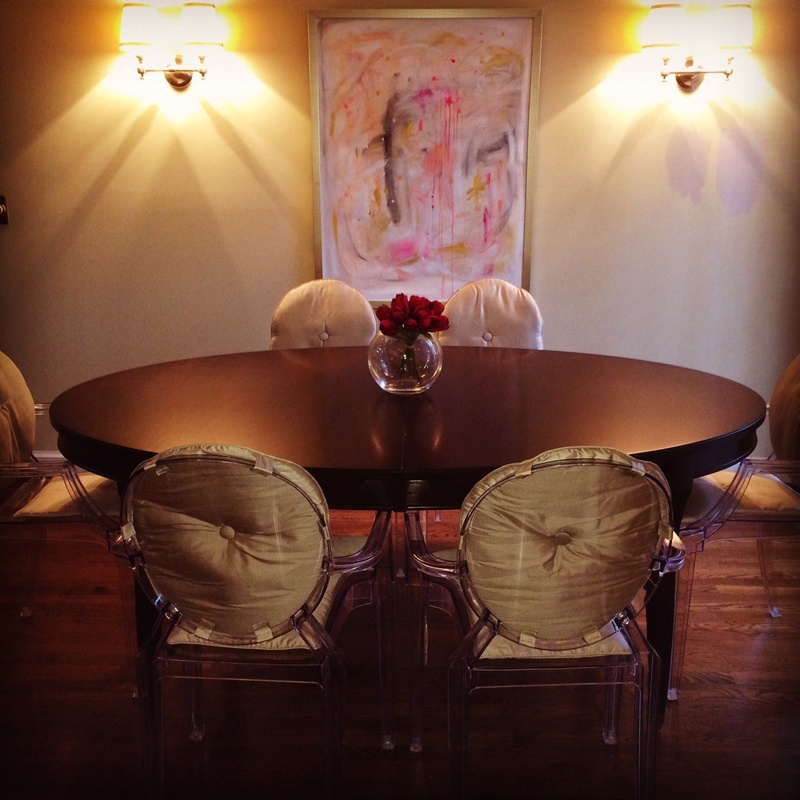 The dining room is also where I proudly display the painting I purchased from Jen Ramos over at Cocoa & Hearts. It’s a work in progress, but finally a space to entertain! Daylight savings time always makes me excited because it means spring is just around the corner! After a winter full of snowstorms, I am ready to shed my winter layers for white skinny jeans, spring dresses, and bright pink nail polish. Like most twenty-somethings, my closet space is at a premium. 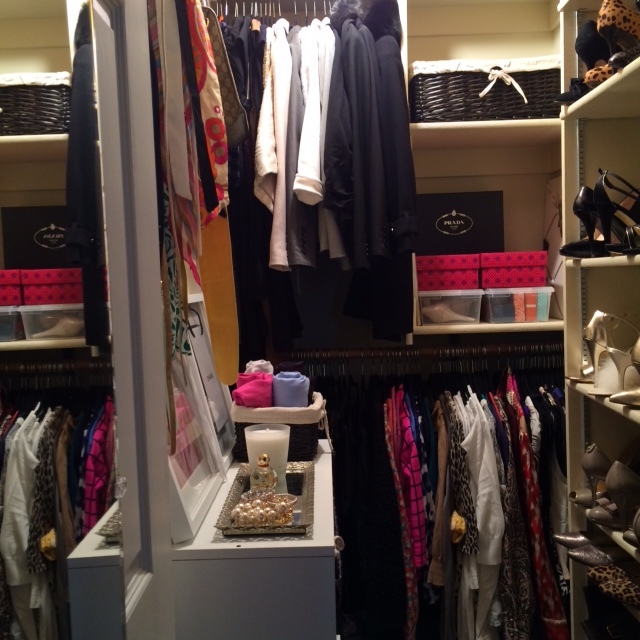 “I simply don’t know what to do with all this closet space” said no southern girl…ever. In anticipation of spring shopping, I’m using my Sunday afternoon to clean out a bit and make way for new favorites. 1. If it’s broken, stained, torn, etc. it goes…either to the tailor to be fixed or to be tossed. 2. If it doesn’t fit (and hasn’t for years, but I still love it)…donate or sell and let someone else enjoy it! 3. If I don’t feel good in it, sell it (consignment, ebay, etc.) and use the money for a new lip gloss or mani-pedi that will make me feel great and remind myself to avoid whatever reasoning prompted me to buy said item in the first place. The exception: special occasion wear! 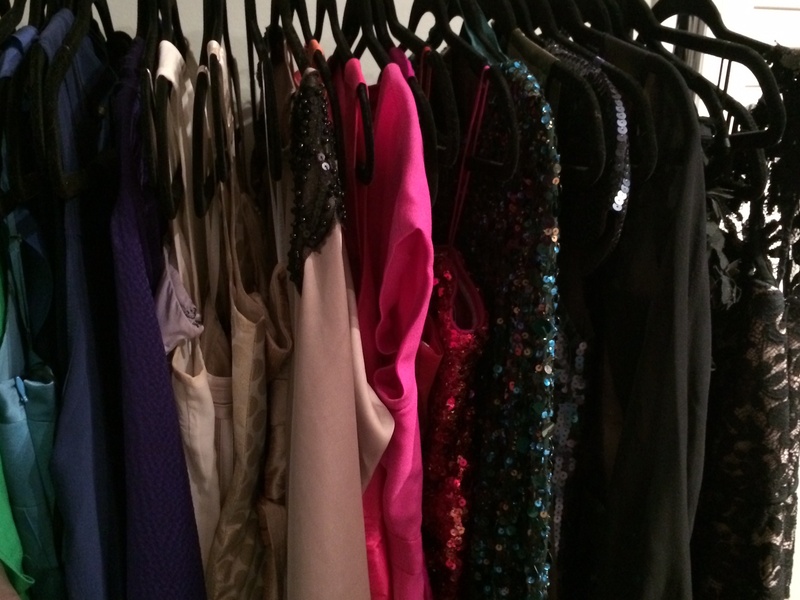 I keep mine on a clothes rack in the guest bedroom because seeing all those silk and sequin dresses makes me smile. It also allows everything to be ready to wear and visible the instant a last minute cocktail or charity ball invitation comes my way. I would hate to say no to such fun because I didn’t have a thing to wear.